I've been using a side-by-side imaging setup on the G11 for about a year. In this time, I've found that while the extra mass helps stabilize the guide movements, the tradeoff with additional weight is a setup hassle. 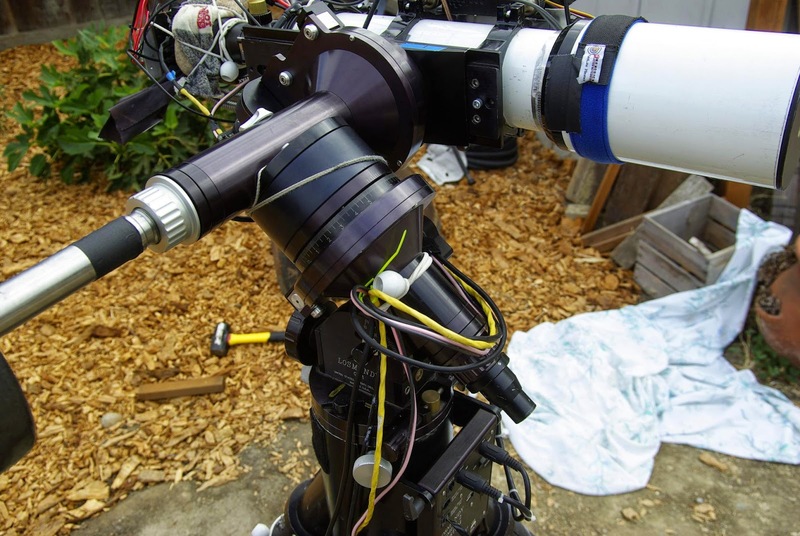 When I put the water cooling system together, I wanted to put the Orion miniguider to work. 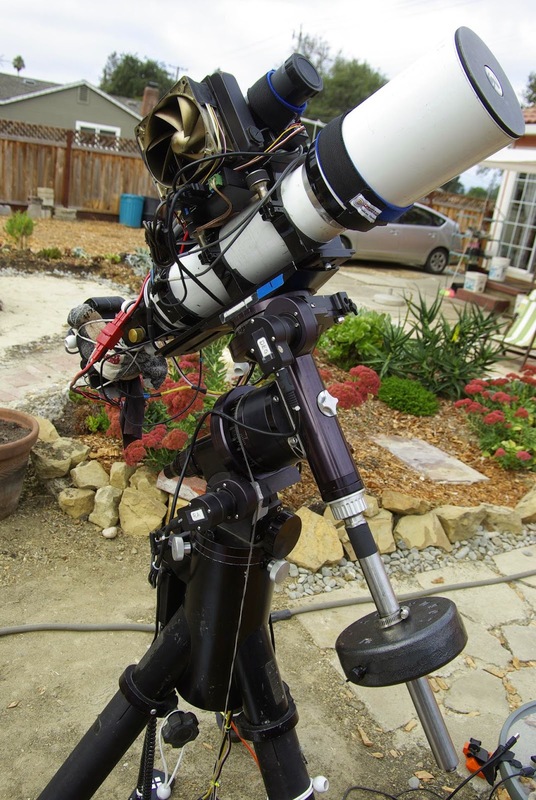 I'd tested it before and once the little telescope is properly focused with a fully calibrated SSAG, it shows a lot of stars, ideal for guiding. Also, the resolved frame is nearly the same size as the APS-C sensor on the SV4. Pulling the side-by-side configuration apart was a struggle in itself! The dovetail bar that the SV4 has been mounted onto for the last year wouldn't budge. I had to whack on it with my mallet and a piece of 2x2. Finally, after driving the dovetail to clear the screws holding the rings, I was able to remove these without having to continue to beat on the dovetail. Only once the scope was removed from the dovetail was I able to disassemble the side by side plate. I put a new dovetail plate on the SV4 since the old one was beaten up and did some trials on the G11. I quickly found out that the 50mm RACI finder, cable harness, and water radiator imbalanced the scope significantly in DEC. I moved the finder to the opposite side of the radiator and routed the cables differently. On testing, the DEC is still imbalanced but it seems that this should be offset enough to keep the tracking through the zenith with minor work. 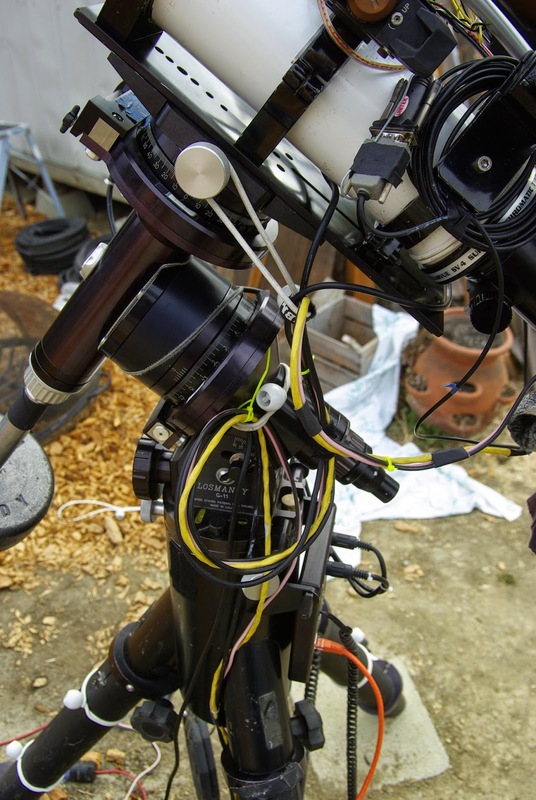 In the pictures above, the new method of routing the cable harness shows how there are multiple loops of extra wire to better allow full movement of the scope across the sky. 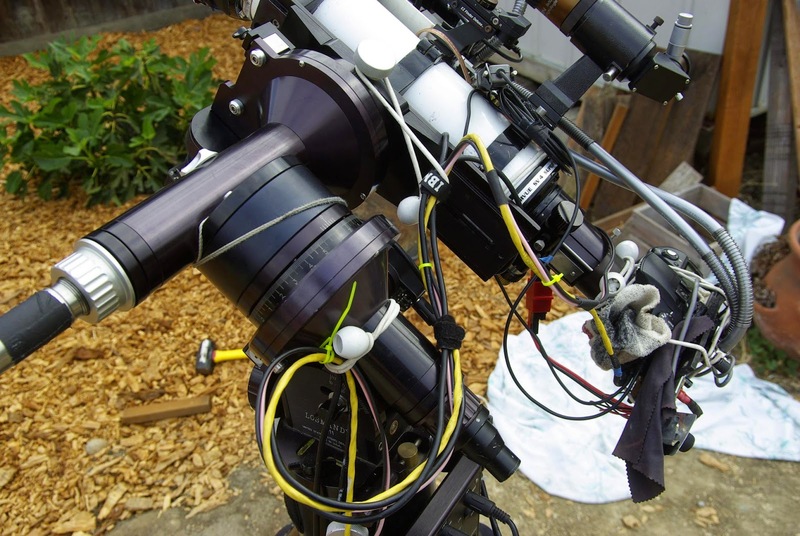 Also seen is how the bungee cord is used to secure a loop to the mount head to reduce the load on the camera. I was able to get the system to test through some breaks in the clouds at night. Just enough for calibration, re-leveling of the mount due to a slipping leg clamp, and a new set of calibration files for Maxim. 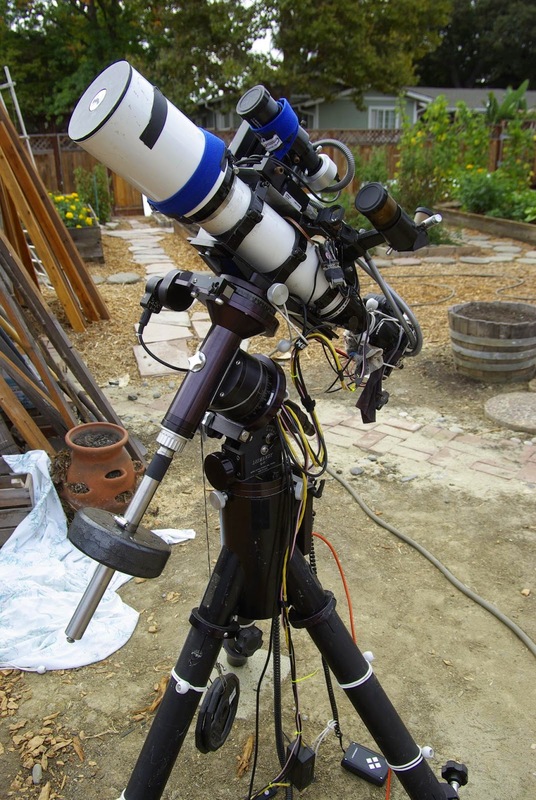 Since this is a different SSAG and scope, I was not able to reuse the old master dark/bias/flats. The clouds cleared after 1:30 am and I was able to get a session running through until morning. What I found was interesting. The RA drift seems smaller and more controlled. This could be due to polar alignment being improved. RA 20h 24m 22.9s, Dec +40° 27' 06.8"
RA 20h 24m 25.1s, Dec +40° 27' 13.0"
It still figures to about 1 arcsecond per exposure drift with a mix of RA and DEC. It's noticeable in the subs as a slow stepping movement. I think that while it shows as unavoidable, the choice to go with a shorter duration is a good one.